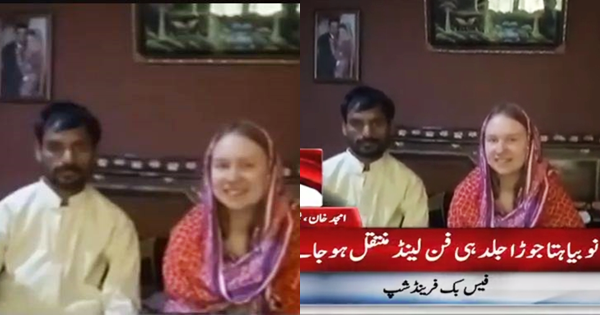 A girl from Finland arrived in Pakistan to meet her lover in Arifwala, pakpatan city of Punjab after their Facebook friendship turned into love following which they chose to end up living a happy married live together . According to the details, a boy Gulshan Rocks Bhatti of Christian colony found himself in love with 22 years old Katherine of Finland during facebook conversations. Roshan got the visa of Finland to marry Katherine and brought her to his hometown yesterday (Sunday). Katherine while conversing with local news reporter said that she was extremely happy in Pakistan since her in-laws cherished her as their own girl adding that she had overlooked the liberty of Finland as she saw rich Pakistani culture.